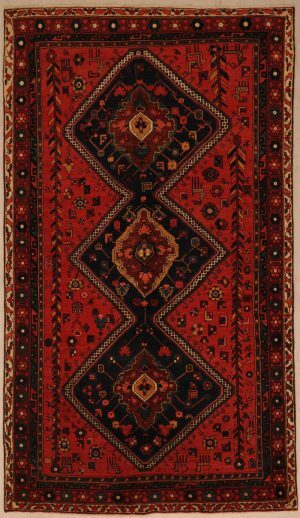 Bakhtyari rugs are hand woven by the Bakhtyari tribe, one of the oldest and most well known Persian tribes. Formerly nomadic by nature, around the 19th century the Bakhtyari tribe eventually established a settlement in the Zagros region, southwest of Isfahan. 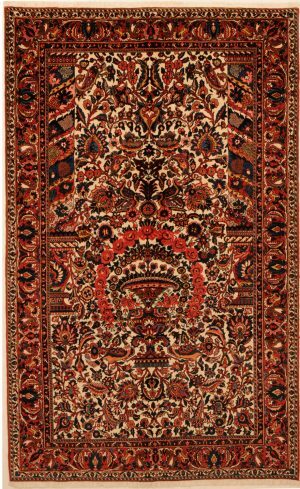 After they had settled down, the production of rugs increased tremendously and the rugs that were produced were of much higher quality too. Today there are almost 200 rug-weaving villages in this area and some of the most charming rugs you can find anywhere are produced in this region. The center of the Bakhtyari weaving area is now in Shahr-Kurd, southeast of Isfahan. Although the rugs created in the different villages have slight variations, all Bakhtyari rugs are brightly colored and have busy patterns that are mostly geometric and occasionally semi-geometric. Most rugs will have a very conspicuous checkerboard or latticed garden design with a variety of bird, animal or plant motifs filling each square or compartment. The compartments can be square, diamond, or hexagonal in shape. An interesting feature of these rugs is that each compartment will usually present a different motif and color scheme from that of the neighboring compartment. The end effect is a mesmerizing medley of designs and colors that can have you looking at it for hours as you inspect all of the variations. The most popular design is the ‘Kheshti’ design which consists of a garden field with compartments or squares filled with roses, flowers and tendrils. Another popular design is that of a decorated field with floral ornaments and lattice designs. 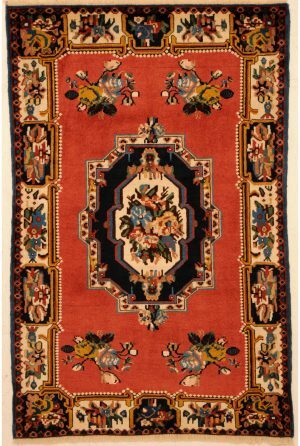 The roses and pattern of these rugs clearly reflects the influence of Aubusson and French rug making. Most of the older Bakhtyari rugs feature beautifully rendered design elements from Persian flora and fauna. However in recent years artisans have adapted the design to meet the variety of demands of the world carpet market by also making rugs without this traditional motif. Unlike most other Persian rugs, curvilinear designs are very rare in Bakhtyari rugs although geometric designs can sometimes be seen. 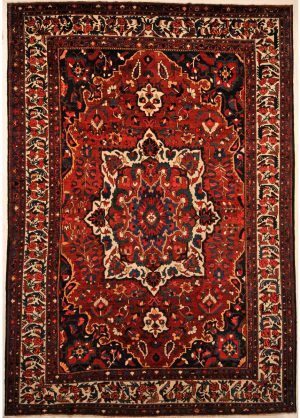 Bakhtyari rugs are thick, solid, sturdily knotted and rank among the brightest and most colorful of nomadic Persian rugs. 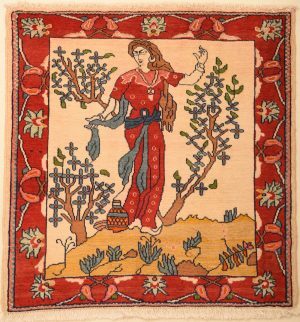 The Bakhtyari weavers were primarily shepherds and each weaver usually used wool obtained from their own herd. This region is known for having very luxurious wool that produces excellent rugs. The pile is generally clipped medium high to high. 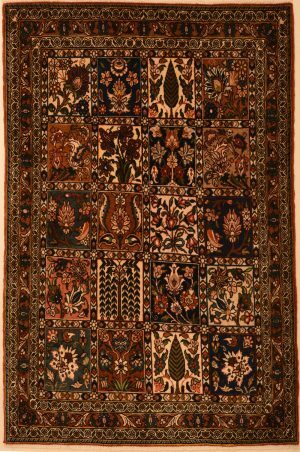 Bakhtiari-style rugs have another branch of rugs called “Bibibaff.” These are only made by women and are considered among the finest and most traditional of the rugs from the Chahar Mahal region. 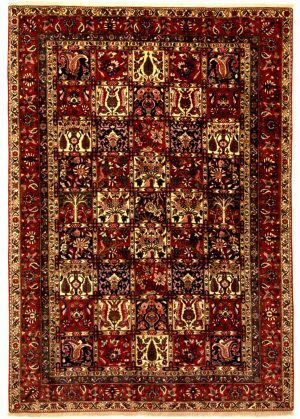 Other high quality rugs from this region are the Saman and Chapel Shotur varieties.